The Trust has been very active in recent months. The trustees would like to take this opportunity to let our kind donors and other members of the Company know what we are doing and thank them for their generosity in donating to our work. Residents of Wells snapped up 18 unique stone sculptures on May Bank Holiday Monday as the Festival culminated in an exciting and competitive live auction outside the Bishop’s Barn on Wells Recreation Ground. 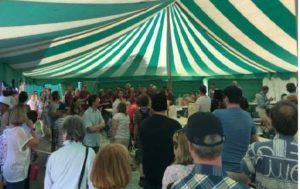 Over £6,000 was raised from the auction, the profits of which will be donated to the Bishop’s Barn, as the trustees of the medieval tithe barn – one of only a small number still standing in the UK – seek a purpose for the building that will bring in a sustainable revenue to cover its upkeep. 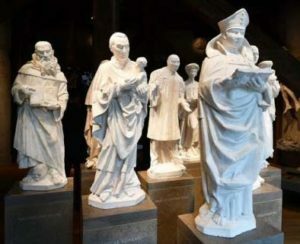 Artists from across the country produced eighteen carvings, including one by the winner of the European stone carving festival in 2017 and masons from Winchester Cathedral. The Charitable Trust assisted with the administration costs of the event and awarded a tool prize to the winning artist. 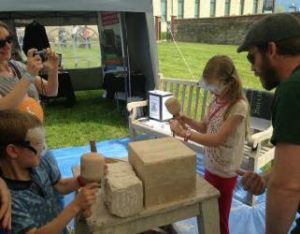 The Festival was organised by Yeoman Mason Paul Roddan of Somerset Stonemasons who said: “Having competed in a few stone carving festivals myself in the past I was keen to establish an event in Wells given the strong connection the city has with this ancient trade”. It has already been reported that The Charitable Trust supported the restoration of the plaster maquettes (models) of the life-size stone sculptures of ten modern Christian martyrs, carved by Freeman Tim Crawley, that were installed above the Great West Door in 1998. The maquettes have been given pride of place as visitors enter the newly opened Galleries in the triforium of the Abbey – the first time that the space has been publically used since construction. The Trust was represented at the first of several opening events and is given full credit in the exhibition and the very interesting guidebook. It is hoped that we will be able to organise a group visit for donors and others later in the year -to follow our visit to Canterbury Cathedral, which was reported on in an earlier eBulletin. The Galleries have been given considerable critical praise for the use of this medieval space and for the exhibits that are now shown there – many of which are on display for the first time. This year, for the first time, the Trustees agreed to award a prize for a stone sculpture at this exhibition. The Society was formed in 1905 with just 51 members. It now has over 600 who are all professional artists, many of whom are based overseas. 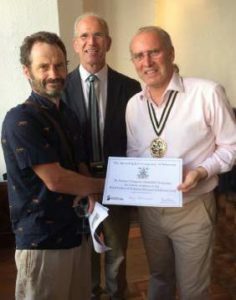 The Masons’ Company Charitable Trust prize was awarded to Guy Stevens, for his work “We don’t understand what it is”, which was carved from Kilkenny limestone in his workshop in Brighton. The decision was made by a judging panel headed by Liverman Nina Bilbey, senior stone carving tutor at the City & Guilds of London Art School, together with the Master, Andrew Bowles and Deputy Chairman of the Trust, Bill Gloyn. The Master presented Guy with the prize onone of the hottest evenings of the year. Shirtsleeves were certainly the order of the day! The Exhibition opening on 25th July was attended by a good number of donors and other members of the Company. The Exhibition is open to the public, free of charge, until 16th September in the Society’s headquarters – Dora House, 108 Old Brompton Road, South Kensington, London, SW7 3RA. 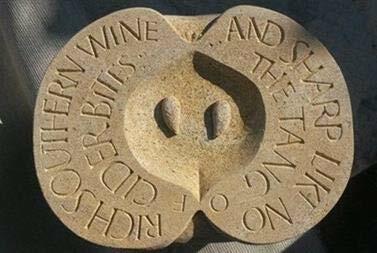 Until 30th October, there is an exhibition of letter carving in the Garden – on the theme of the plants that contribute to drinks and beverages – mounted by the Lettering Arts Trust as part of its 40th anniversary celebrations. The Charitable Trust has supported this organisation for many years and was delighted to be among the guests for the opening. The exhibition is free to all those who visit the garden, which can be found at 66 Hospital Road, London, SW3 4HS. This Festival is again being organised by Yeoman Mason Carrie Horwood of Cat’s Eye Carving. It will be held in the grounds of Llanthony Secunda Priory, Llanthony Road, Gloucester, GL2 5QT. The funds raised are going to the Priory Trust, which is in the final stages of restoring this medieval building, and the Samaritans, incidentally one of this year’s Lord Mayor’s charities. The Charitable Trust has been delighted to support Carrie, as it did in 2015, with assistance towards administrative expenses and a prize for the best carving by an active stonemason. 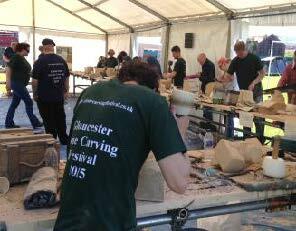 There will be around sixteen carvers competing for the prizes, some of them members of the Company. The theme will be “Magical and Mystical Creatures” – to be carved out of Cotswold limestone. The event will be open at 10.00 and close at 17.00 on Saturday and Sunday. Carving will stop at 12.00 on Monday with an auction of the pieces by a leading local auctioneer to follow the prize giving at 13.30. There will also be a raffle for a wonderful piece by Carrie – “Demeter”, the Greek Goddess of Harvest and Grain, carved out of French limestone from Caen in Normandy. The site will have a range of stalls and refreshments available as well as a “Have-a-go” area for visitors. It is also close to the Gloucester Quays retail centre. These Festivals are popular with a wide variety of visitors, young and not so young. Our support of them is aimed towards the Company objectives of encouraging the use of natural stone and supporting those who work with it.